Hmm. For some reason, my phone thinks that this page is in French. Silly phone, images aren't in a language! In any case, this seems to be an OC replica of one of the Changeling warriors from the Canterlot Wedding episodes. The pose, eyes, race, and hairstyle all point to this being heavily based off of a Changeling that was transforming into Twilight in the episode. You've got a bit of wonky proportion though. The head is bigger than it should be, while the front legs are both smaller than they should be and also appear disconnected from the body by your linework. Also judging by your linework, I assume you're not the most confident with drawing. Frankly, though, this is a rather good attempt. Many people end up just tracing stuff, but it seems you put in a real effort to try and replicate the pose on your own. Don't get discouraged, especially about proportions. I know people who've been drawing for years and still have proportion problems. That's why references are super helpful at really any level. Also, can't remember Moondancer's cutie mark so I might be wrong about this being an OC. Silly phone, images aren't in a language! But she is indeed supposed to be Moondancer. But yeah, I'll echo Dusk's comments about this needing some polish regarding proportion and finishing touches, also since the fire signaling the transformation was so subdued, I almost thought moondancer got changeling legs stitched to her. It was a good attempt, but a little extra work would've made it shine all the more. 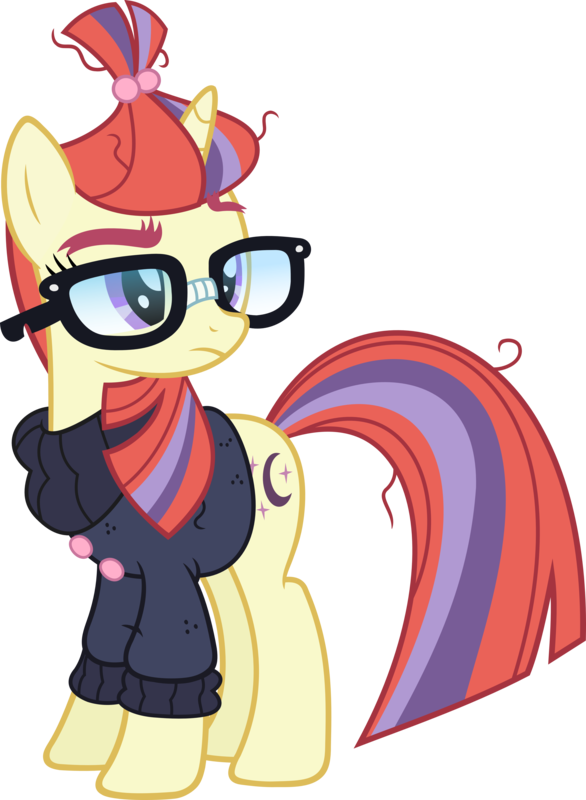 Judging by the cutiemark and hair color, this is supposed to be Moondancer. My question is did you purposefully leave out the glasses? The lack of them bothers me. And I, once again, find myself echoing >>Zaid Val'Roa. The fire is a little subdued. The Artist is getting some of the basics right, as this is recognizably a pony/changeling. The pencilwork and coloring is decent, but the scan should be adjusted to make it and the colors brighter. Artist, if you can just put a decent skeleton under your work, your artwork will improve enormously. Those exercises where they show you how to draw ponies using geometric shapes? Practice with those a bit! Your proportions are off in this piece, and this, combined with the shapeless torso, give the whole thing a feeling of sloppiness. Mastering basic forms and keeping an eye on proportions will take your artwork to another level. The thing that's preventing me from seeing this as Moondancer the most, more than the obscured cutie mark, more than the lack of glasses: the absence of her freakish eyebrows. My #3 art pick. I love that it's hand-drawn! I like the way that the concept of the piece works with the title. And buck it all, I certainly can't draw that well. A couple general things before I get to the comments. The picture I took is terrible. I used the camera on my 10 year old Mac. So, colors and stuff got a little weird. It's also a little crooked. Furthermore, I have never been able to art. Like, I actually surprised myself with how well this turned out, considering. So here's a story for you, I did base this very heavily off of Twilight. In fact, if you look carefully, you can see the remains of the wing lines. But then I thought to myself, "Twilight is so overused." So I did a quick think, and remembered Moondancer is a recolor of Twilight. So I made her. The proportions? Well, I'll get to that with GGA. I wasn't really sure how to make a good fire signalling where it 1. Didn't cover the cutie mark too much, 2. Didn't cover the entire body, and 3. Could still be seen with dark-ish green on black. I mean, I voiced my actual complaints. I realized I forgot the glasses when it was too late to do anything. I tried doing geometric shapes once. It failed. And then I took my artless self (I've never been able to art) and went to do other stuff. This one I just freehanded. And yeah, I'll certainly practise stuff when I have time/ motivation again. Yeah... I kinda sorta based her colors on a fan drawing that didn't have them. Also, I really hate them. So my excuse is they sorta faded away like the eyes. #3? Yay! I feel so special. Now go and try to draw better than this.